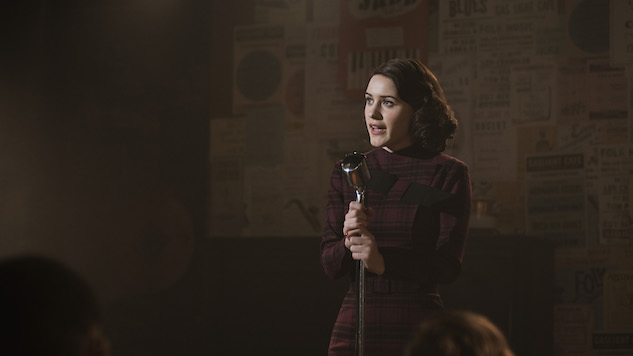 Amy Sherman-Palladino and Dan Palladino’s quirky Amazon comedy The Marvelous Mrs. Maisel is usually summed up as that show about a spunky 1950s New York housewife (Rachel Brosnahan) who accidently discovers she’s a stand-up prodigy. But Sherman-Palladino stresses that the series, the first season of which has received recognition from both the Golden Globes and the Emmys, is much deeper than that. The Season One finale seemed to show Midge on the up-and-up. Will that be true in the second season? “Good things can’t last long,” Brosnahan teases. What does this mean for Midge’s manager, Susie Myerson (Alex Borstein)? What’s in the future for Midge’s on-again/off-again husband, Joel (Michael Zegen)? “He’s stuck between a rock and a hard place because, on the one hand, he saw that Midge was really talented, and on the other, it’s a blow to his ego that she is this talented,” Zegen says, teasing that this dynamic of Midge succeeding at something he’s always wanted will be explored further in the second season. Brosnahan says we’ll also see the two deal with “their attempts to co-parent” their young children. Are the creators feeling the pressure to avoid a sophomore slump after the first season was such a big success? Maisel is about a housewife who lets out her frustrations on stage and suddenly realizes she’s an amazing stand-up. Is this to say that all housewives would be good at stand-up comedy? “They’d have a lot of material,” Brosnahan deadpans. How did the Sherman-Palladinos land such glorious costume and production designers? “We were very lucky, because HBO had unexpectedly cancelled Vinyl, so there were a lot of extraordinarily talented people wandering the streets of New York thinking, ‘I thought I had a job and now I don’t have a job,’” Sherman-Palladino jokes. She says they grabbed any and everyone who was wearing a Vinyl crew shirt and looked sad, such as production designer Bill Groom and costume designer Donna Zakowska. Kevin Pollack, who plays Midge’s father-in-law, has been upped to a series regular. He’s also an accomplished stand-up. Does that mean he chimes in for accuracy? He says that his friends in the stand-up community tell him how great Brosnahan is in the role, and that they’re shocked she doesn’t do stand-up herself. How do the writers achieve the accuracy of these characters and time period? Sherman-Palladino says that she grew up in this world: Her dad was a comic, she used to work at West Hollywood, Calif.’s famous The Comedy Store, and she knew comedians like Sally Marr, Lenny Bruce’s mother. They also have an “extremely qualified researcher” to find out if certain words were part of the vernacular in 1958. Will the show depict any of the diversity in New York and the stand-up scene that was happening in the late 1950s? The show has gotten both good and bad attention for its portrayal of Jewish people. How do the Sherman-Palladinos feel about that? Palladino says they’ve gotten “really excited” feedback from older Jews, particularly because they will show parts of that culture without over-explaining them.